Discounts are available for Trimer Codon Mix 2 Antisense! 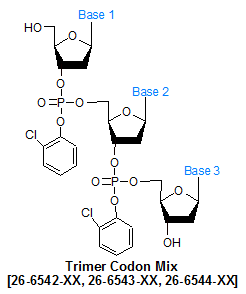 Trimer Codon Mix 2 omits the codon for cysteine and contains codons for the other 19 amino acids. This option is for those researchers who specifically want to exclude cysteine from their protein/peptide libraries. Such omission is often done to avoid complications resulting from intrachain and/or interchain crosslinking between cysteines, via their thiol groups, to form disulfide bridges. Different combination in percentage of the individual 20 amino acid mix codons can be ordered to be synthesized at the same codon position. Similarly there is no limit to the number of different sites that can be such modified. At Gene Link we term these sites as 'spiked'. Thus at a single codon position we can spike it with a customer desired percentage of a particular codon or number of amino acid codon. The maximum length of the oligo is 250mer. Trimer Mix Codon Usage Table & Reaction Factor Trimer Mix Codon Usage Table. Directed molecular evolution and combinatorial methods are key strategies used for protein engineering research. These approaches commonly involve using partially randomized synthetic oligonucleotides to generate a partially randomized gene library, expressing it in an appropriate vector to generate the protein set encoded by the library, and then screening the expressed proteins for improved or modified characteristics. Examples of the latter include changes in protein-ligand binding affinity, enzyme selectivity, or protein stability. While a variety of site-directed mutagenesis methods can be employed to introduce randomization at specific base positions of a gene, such methods often introduce significant amounts of undesirable codon bias, frame-shift mutations, and stop codons into the library, due to the mismatch between the base-by-base nature of classical oligonucleotide synthesis and the triplet nature of the codon (1,2). The problem of unwanted codon bias can be eliminated by synthesizing the random portion of the oligos codon-by-codon, with trimer phosphoramidites, instead of base-by-base. This codon-based mutagenesis system conveys the ability to effectively control codon bias in the system, as well as unwanted stop codons and frame-shift mutations. The researcher can choose to completely randomize a particular amino acid position in the expressed protein, or flexibly tune the relative amounts of different amino acids at that position, as needs require (3). Trimer phosphoramidites have been used to develop phage display libraries with greater diversity (as much as 10x greater) than by traditional methods, with a high degree of amino acid uniformity (4). Trimer phosphoramidites were also used to maximize the diversity of a partially randomized library for use in developing streptavidin variants with altered specificities for desthiobiotin, a biotin analog, by directed evolution (5).The combination of standard and custom Trimer Codon phosphoramidite mixes is a powerful research tool for anyone doing protein engineering research. 1. Neylon, C. Chemical and biochemical strategies for the randomization of protein encoding DNA sequences: library construction methods for directed evolution. Nucleic Acids Res. (2004), 32: 1448-1459. 2. Randolph, J., Yagodkin, A., Azhayev, A., Mackie, H. Codon-based Mutagenesis. Nucleic Acids Symposium Series (2008), 52: 479. 3. Kayushin, A., Korosteleva, M., Miroshnikov, A. Large-scale solid-phase preparation of 3�-unprotected trinucleotide phosphotriesters-precursors for synthesis of trinucleotide phosphoramidites. Nucleosides Nucleotides Nucleic Acids (2000), 19: 1967-1976. 4. Krumpe, L.R.H., Schumacher, K.M., McMahon, J.B., Makowski, L. Mori, T. Trinucleotide cassettes increase diversity of T7 phage-displayed peptide library. BMC Biotechol. (2007), 7: 65-72. 5. Levy, M., Ellington, A.D. Directed Evolution of Streptavidin Variants Using IVC. Chem. Biol. (2008), 15: 979-989.